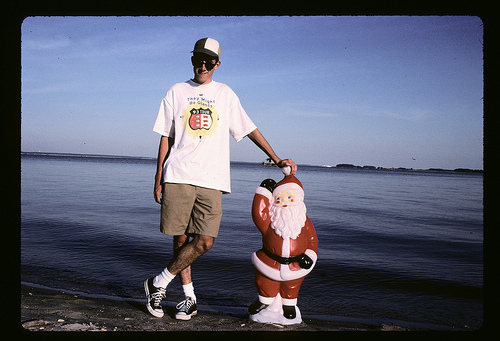 Mike and Chris stole a plastic Santa from someone’s yard one Christmas. The plan was to take it all over the place, take pictures of the Santa there, and then return the Santa and pictures to the yard the following Christmas. I don’t know if they ever finished their project. Here’s Santa and Mike. Not sure where. I always wondered if they finished this project too. I think I remember them getting a fair amount of worthwhile pictures, like ones out of the country, so I don’t see why they wouldn’t have got it back into the yard. Haha – I don’t think we got that far at all. I’m guessing this pic was in OC. The Santa wound up in Chris’s shed shortly after. Looks odd to be OC. No sand and land across the water. If it is OC, it’s not on the beach side. Also doesn’t look like OC pale sand. I just had a thought. Didn’t you and Chris drive south somewhere after graduation? Sort of an abbreviated road trip? Yes. And Chris ran out of money buying hotdogs or lemonade or something silly. So we had to come home. It is probably why we made it only as far as the Southern side of OC.